<textarea> element is defined as a multi-line text input control of the HTML document. <textarea> tag holds the number of characters and text with fixed width font. <textarea> tag belongs to Flow Content, Interactive content, listed,labelable, resettable, and submittable form-associated element. The new attributes are added in HTMl5. It is free learning portal. <textarea> tag used to get multi-line text as a input. 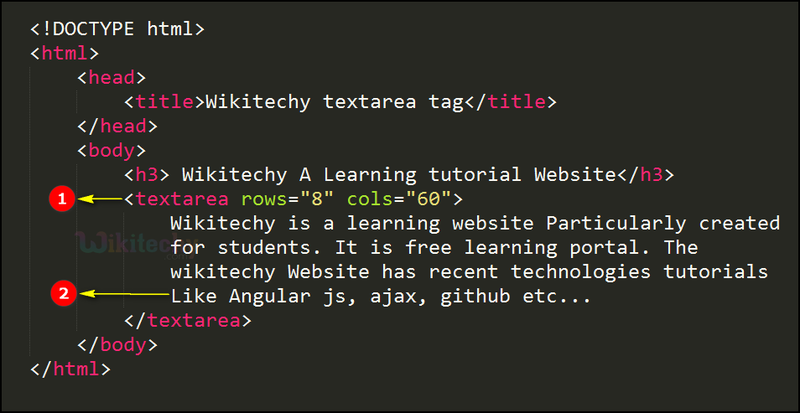 “Wikitechy…” that the contents given within the <textarea> tag. The term “Wikitechy is a…..”displayed with the multi-line text control with fixed font size. Autofocus autofocus Yes Yes A text area should automatically get focus when the page loads. Cols number Yes No Visible width of a text area. Dirname textareaname.dir Yes Yes The text direction of the textarea will be submitted. Disabled disabled Yes No A text area should be disabled. Form form_id Yes Yes One or more forms the text area belongs to. Maxlength number Yes Yes Maximum number of characters allowed in the text area. Name text Yes No A name for a text area. Placeholder text Yes Yes A short hint that describes the expected value of a text area. Readonly readonly Yes No A text area should be read-only. Required required Yes Yes A text area is required/must be filled out. Rows number Yes No The visible number of lines in a text area. soft Yes Yes How the text in a text area is to be wrapped when submitted in a form.